The last few days have been extremely frustrating in the Studio. Monday I shouldn't have even stepped foot in there. Everything, and I do mean everything I sewed was wrong. I ripped out and re-sewed nearly everything I touched. I sewed things backwards, I cut wrong, I measured wrong, I sewed wrong side to right side..... Ugh!!! I'd love to show you all my mistakes but they're on top secret projects so no sharing yet. Tuesday was a little better. I did accomplish a little more on Tuesday and didn't even attempt to sew anything. I was too busy trying to catch up on customer quilts. Queenie was humming! Today was off to a good start.... until this happened. OH SNAP! How does this happen? How does the thread slip out of the tension disc right in the middle of the quilt. I had no idea it happened until I went to pull up the bobbin thread at the end. When I pulled on it there was no tension. It pulled out way too easy. And this is what I found on the back. That would be an area about 40" wide by 18" high, which equates to about 700 square inches of quilting. Almost half the quilt! It took me 2 hours to frog it (rip it, rip it). Why does it take 15 mintues to stitch out on a longarm machine but 2 hours to unsew?!! That's quite a pile of thread I just ripped out! Oh well, such is life in the Queen's Palace. Tomorrow's another day and I've got a long list of things to accomplish. Lots of things are happening and I can't wait until I can share them all with you. You know how much I hate secrets. 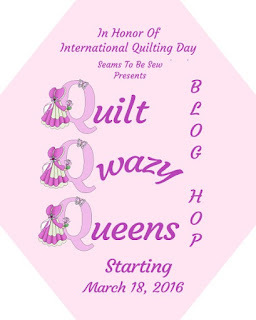 Also a quick reminder that the Qwazy Quilt Queens Blog hop is going on right now. My day is just around the corner, on Friday. And the Traffic Jam BOM quilt along is due to post on Monday. Grab the Traffic Jam Pattern and sew along with us. 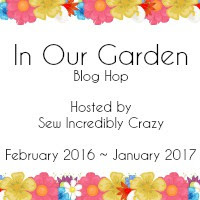 And last, but not least, The In Our Garden BOM Blog Hop for April will post on April 1st. 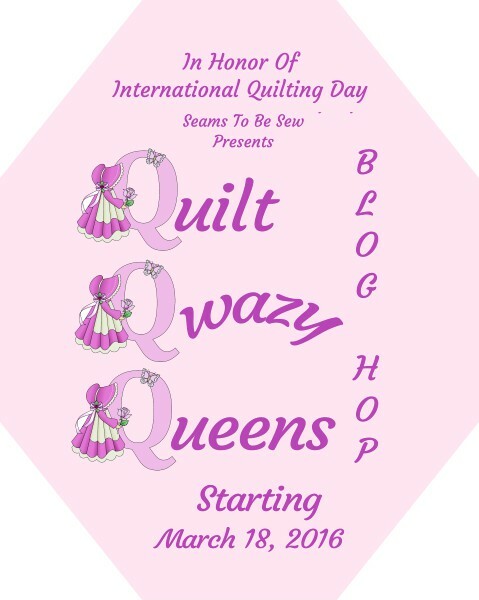 April is my month and I am loving the cuteness in this blog hop. Come on back and check it all out. the older I get, the more I rip out. Its so frustrating. Sometimes I just have to walk away from it. Ugh....what a day!!! That was a lot of ripping out. I really don't mind ripping out lousy stitching - it comes out so much easier then when you do a complete 10' border and decide you hate it and it has perfect tension!!! At least Queenie does the quilting herself, all my quilting is hand-guided, so it takes much longer to quilt. Hope the rest of your week is better and more productive!! !